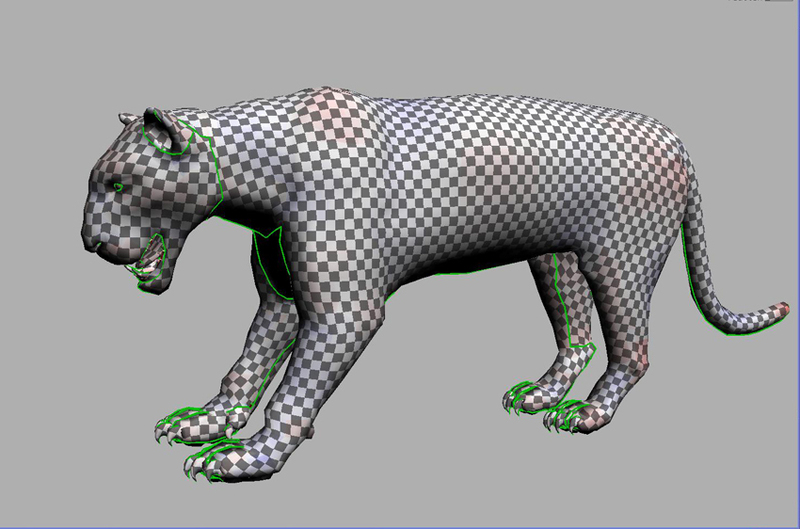 I am creating this beasty for the "Cgtalk HMC10: Animals in Motion" and thought you might be interested in taking a look at it. I sure am interested in your opinions and perhaps further advice and comments on the unwrap. Lets hear it from you guys! PS: Thanks again for an increasingly awesome tool, Phil. Looking good! 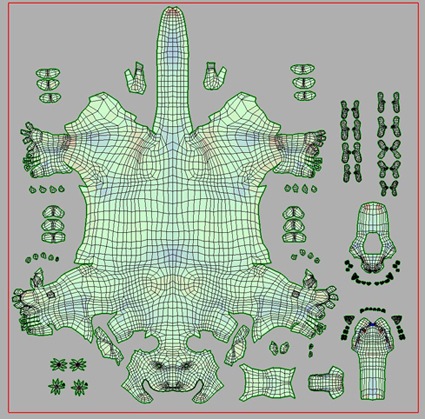 By the way, if you want those UVs to be perfectly symmetrical, you can use the Symmetry Find tool even on an existing layout. Have a look at the videos in the "Advanced Tools" section of uvlayout.com/videos. The second one I think shows you how to apply it to already flattened meshes. Yeah, I watched both vid's after I had flattened almost half of the mesh and was able to successfully apply a lot of the info. Many thanks for the vids as well! However, I ran into weird issues were the symmetry would not work on isolated polys (dark yellowish coloring) spread out randomly over or close to parts of the outer edges, although the mesh is completely symmetrical. So I had to disconnect those parts and flatten them speparately. It all worked out nicely though, so no big deal. Any ideas or suggestions what could be the issue? "... (dark yellowish coloring) spread out randomly over or close to parts of the outer edges, although the mesh is completely symmetrical. " Cool. Good luck in the competition. That map looks ideal for some seamless texturing. Maybe put a couple of extra darts in the tip of the tail, unless it'll be hidden by a few separate tufts of hair parented on the end. What do you mean by "darts"? One-edge cuts? I think it's a tailoring term .. it means cutting one or more slits into a mesh from the edge. Allows compressed or stretched polys to resize. The red on the tail tip indicates compressed polys, so cutting the single dart that's already there even deeper might be a problem, because the polys want to expand (they'll overlap). Just work out where the tension is, and experiment with a few small cuts to lessen the red. Normally a small amount of red isn't a problem, but you really want sharp hairs on the tail tip to make your animation zing. I already followed your advice and reduced the red on the tail with a dart there. One and some additonal flattening were enough to do the job. Not wanting to sound like a real weirdo...but this unwrap looks real good, almost an art in itself. the challenge is done and in case you are interested check out the final entries on CGTalk for voting. As I put this here, the voting thread is not yet up, so I cant link you there, but I am sure y'all can find yer way to the site and appropriate forum blind-folded. "I could'nt have done the layout as speedily as I did without Phil's awesome tool here. Great work on Phil's part!" Found your final tiger renders at cgtalk ... they wowed me! Those action poses really make a difference to the interest of the image; I'll have to keep that in mind when doing graphics for uvlayout.com. Would you like me to upload some of the final images here? I wasnt sure if that was appropriate or not, since I didnt want to distract from the purpose of this forum. Btw, the tiger is not done with yet. I still plan to fully texture him and apply a complete fur coat, but that will have to wait a little while due to other work.